I started reading the old Ram the email from B__________ [DFG management] but he stopped me after I read the part where they wrote: As [our biologist] has said, we are supportive of getting repairs done to the drinker and road but need to be certain any and all environmental issues are addressed. 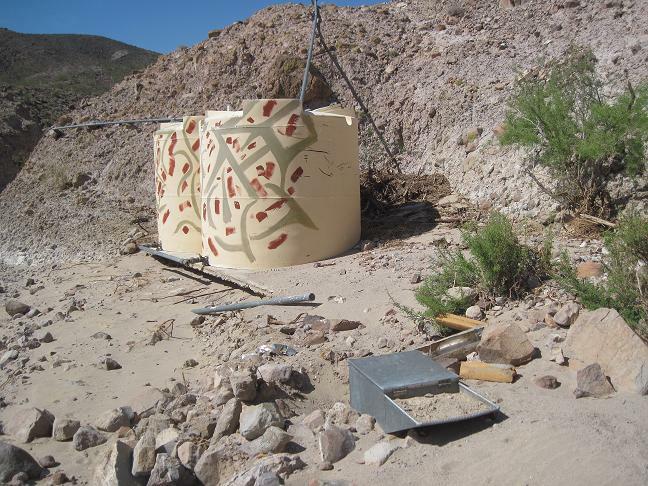 We defer to BLM since this is on their property and assume they are taking responsibility and addressing any potential water quality or discharge issues (permitting requirements). Given some of the recent litigation associated with flood damage allegedly resulting from road and other construction, we need to make sure we consider all the legal requirements to protect all of our interests. The old Ram asked me who B_________ was and I told him he was Fish and Game. He asked why Fish & Game would defer the welfare of the Desert Bighorn Sheep to BLM, the people who regulate rock rolling? I told him I didn’t know. He then asked what the potential water quality or discharge issues were? He asked if we were going to use contaminated water for something? I told him as far as I knew we didn’t intend to use any water for anything, but sometimes when men are working they pee on the ground. He shook his head and snorted and said in his opinion B_______ probably squats to pee. He then asked what the litigation about flood damage was about. Again I had to tell him I didn’t know. He asked if the guy who squats to pee realized that Mother Nature just put many-many-millions of gallons of water down that wash and no one had said anything about litigation. He added that there were no homo sapiens, the breed that might like to bring a lawsuit, within 50 miles of the wash and they certainly wouldn’t be flooded if someone pees on the ground. (He pronounced our breed “hemorrhoid sap eons” but he was a little cranky and he had big horns, so I didn’t correct him.) I just told him I didn’t know what water quality/discharge or flood damage had to do with rock rolling. He then asked how many lanes the road into the drinker would be. I told him it would be a single path, not a lane, and it would be about 8 feet wide. He pointed out the mouth of the wash was about a mile, 5,280 feet wide, so 5,272 feet of the wash would be undisturbed - - - - - I told him his calculations seemed to be correct, but what if it was 9 feet wide somewhere? He just stared at me and I didn’t press the issue. I read the old Ram the rest of the email and he stared at me again before asking if we were really going to try and drive a truck with a bad radiator to Bishop, and wasn’t that kinda like driving a truck with bad tires to Bishop? He then asked if we were really going to remove the radiator and drive it to Bishop, then go back and get it at a later time ? He pointed out there are radiator shops, just as there are tire shops in Barstow, just a few minutes away. I shrugged - - - - he stared at me for a long time then shook his head and starting walking away, but then he stopped and asked if Fish & Game wasn’t going to do anything other than defer, delay, deceive, debate, declare, blame the deficit, defend themselves and decline, why we even care what they think? I guess he just doesn’t understand people. Flash flood destroys Big Gees! 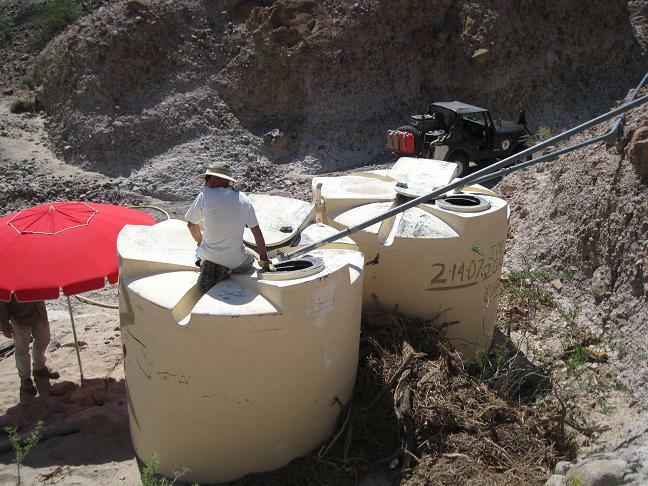 Due to an increased desert bighorn population in the Cady Mountains, the Big Gees water development has needed to have a water hauling effort at least once each year. This amounts to a rather large amount of effort by SCBS during the heat of the summer. Around July 15 a large rainstorm hit the Mojave Desert. One of our more active members decided to check the Automata website to see how much water was collected at Big Gees development in the Cady Mountains. If enough water was collected it might eliminate the need to organize a water hauling project. The satellite monitoring system indicated that there was no signal from the system. Two members organized an immediate scouting party to dtermine that status of the development. They were suprised to discoverd that a large flash flood and scoured the entire canyon for a distance of over 7 miles! This wash is over 1000 feet wide in places so a huge amount of water had passed through very quickly. 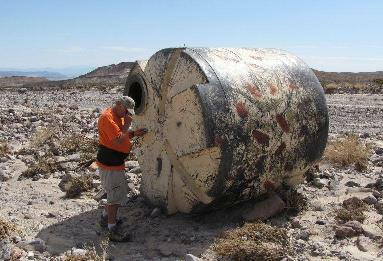 One of the 3 tanks was found broken and tumbled 1.2 miles from the original location. The drinker box was filled with sediment and the plumbing was broken emptying the tanks of what should have been collected. The infrared camera and satellite monitoring system were nowhere to be found. Not good news, if a solution is not implemented quickly it will be a serious blow to the Cady Mountain desert bighorn sheep herd and set our conservation efforts back several years. The digital photos are very informative and will allow us to plan an effective repair project. Many thanks to the immediate scouting efforts of our members! Steve Marschke spent some time glad handing with our existing tank customers and potential new customers. Both Nevada Bighorns Unlimited and the Fraternity of the Bighorn were very happy customers, and Craig Stevenson (retired NV DOW) was offering very positive testimonials to wildlife agencies from many other states. The Saturday evening banquet was culminated with the live auction of many bighorn hunt tags from North America including the California Open Zone bighorn sheep hunt tag. Regina Abella was on stage to explain the details and pump up the crowd. Considering the current economic situation all were happy to see the tag sold for more than $75,000. All of the funds go directly into the big game management fund and get used to further wildlife conservation in California. The DFG has been using the auction tag receipts as the base to apply for federal Pittman-Robertson funds which are matched at the rate of 3 to 1. Many thanks to all of you hunters and outdoors people that purchase firearms and ammunition - your 10% excise taxes are much appreciated and have raised approximately $2 billion for wildlife conservation since 1937.